Have a Question? Tap here to contact us. Browse our Prefab spiral stairs options for your solution. Custom design your stair to be ideal for your setting. Our in-house design and engineering teams have gathered all of the information necessary to do everything from designing to installing your stairs with ease. We want to help you find the right staircase for your project. Learn more about product specifications, installation, and safety. Salter is proud to use premium American materials and regulations. With new buildings featuring these spaces, loft style homes are starting to become more common. From tiny homes to eco friendly houses, people are looking for homes that can fit their lifestyle in a small footprint. One particular design that is becoming popular are loft style homes. Loft style homes maximize their space by eliminating the majority of interior walls and utilizing an open floor plan. 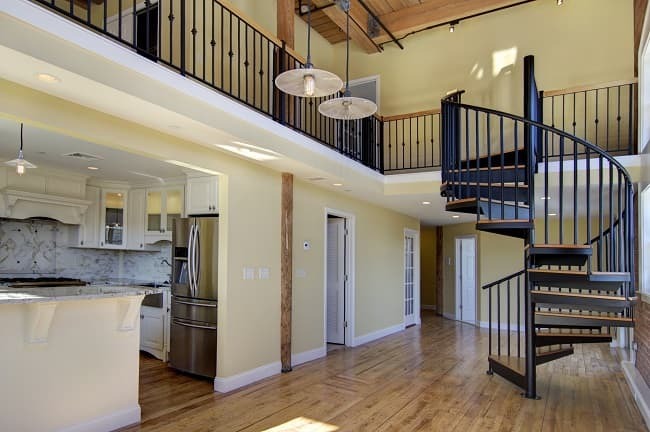 Lofts are traditionally made from renovating old buildings, such as barns and warehouses, and are the homes of young professionals and singles. Loft space ideas don’t have to be limited to a studio apartment with minimal furnishings; you can shape your space with your design choices. Lofts are usually found in renovated buildings and take advantage of the existing architecture. Often times, no two lofts are exactly the same, even within the same building. While they are all different shapes and sizes, there are some characteristics that are found in most loft spaces. Whether they are in a renovated factory or in a newly constructed condominium complex, loft style homes have these standard design features. Large open spaces is the most common characteristic of loft style homes. Because they are typically found in renovated warehouses and barns, high vaulted ceilings are common. The exposed support beams and ventilation systems that come with these buildings add to the typical loft feeling. Some new construction are even adding these in to give the building an old lived in look. While you may think your home would feel cavernous, large open floor plans work well with the high ceilings. It makes your home feel larger and creates a bright and airy space. For organization, you can zone your home using furniture and create natural separations of space. By grouping your furniture into separate spaces within the open floor plan, you’re utilizing small apartment organization to minimize wasted space. There are minimal interior walls in a loft style home. This goes with the open spaces that you want to maximize the square footage of your home. Not only does it allow the free flow of air and light, but it also eliminates wasted space. When it comes to wall materials, there are a few different options depending on the original building’s purpose or your desired aesthetic. Most designers want to keep the original materials in the loft home design and play to the history of the space. Probably the most common material used for loft style homes’ walls is exposed brick. It ties in an industrial aesthetic that is highly sought after in urban areas. For rooms that call for tiles, such as a kitchen backsplash or bathroom, subway tiles are a modern and industrial accent to any home. It can fit well into a number of design styles and doesn’t distract from the overall architecture of the loft home. If you want to incorporate classic drywall into your loft design, stick to lighter shades and neutrals. Because it’s an open floor plan, the walls are long and run the course of the entire loft space. A dark or bright color can easily overwhelm the space and make it feel smaller. The windows and doors in loft homes can put the final touches of the framework created by a designer. They are the punctuation on any structural design that has been implemented thus far. Because of the open floor plan, large windows will play a major role. Lots of natural light that fills the open space makes loft homes larger and brighter. Windows often span the entire height of the wall from the floor to the ceiling. This lets the light encompass any upper levels of the loft, such as a mezzanine floor. For a completely open floor plan, use open doorways and archways to move from room to room. There are no interruptions to the flow of light in this design. For industrial loft style homes, sliding warehouse and barn doors can add a finishing touch to the design. These large metal sliding doors run on exposed metal tracks and can be left open for air and light flow and closed for privacy. Often times, loft style homes maximize space with a mezzanine level. This creates square footage and a second floor without altering the lower level at all. However, you will need a safe means of access that will hold up to regular use. While many loft spaces use ladders, their drawbacks can cancel out their benefits. Ladders are typically used for their small footprint. They take up virtually no room, making them very tempting. However, if you plan to regularly access your mezzanine floor, a ladder is unstable and unsafe. Traditional staircases are the obvious choice anytime you need to access a second floor. You know the design is stable and won’t have to worry about safety. 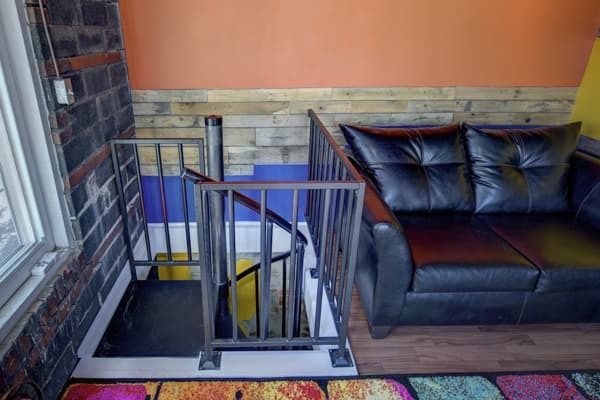 Where this stair design falls short is how it fits into the rest of your home. The bulky frame interrupts the open space that you created and can feel clumsy in your otherwise light home. A happy medium to these two options is a spiral stair. While it’s not always the first thing for loft owners, it takes the best elements of the two previous designs. It has a small footprint that won’t extend beyond a small circle in your home. It also features the stability of a traditional stair with full steps. Loft furniture as a category is quite different from a regular home’s furnishing. In a regular home, the rooms are usually divided by walls. This gives you the flexibility to create a different look and feel in each room. However, in a loft, the furniture is placed in one open area. Not only must all of the furniture fit together into one design aesthetic, but it must also support the function of each zone. Easy ways to define different spaces within an open floor plan is to use area rugs. This lays out the center of one “room” within your loft space. Another way to zone is to turn your furniture in towards itself. You can create small walls with the backs of the furniture. Your furnishings can also define how you lay out your space. Multifunctional furniture is popular option for lofts for their space saving designs. The most common design is a couch bed hybrid. This furnishing has come a long way from metal frame futons. 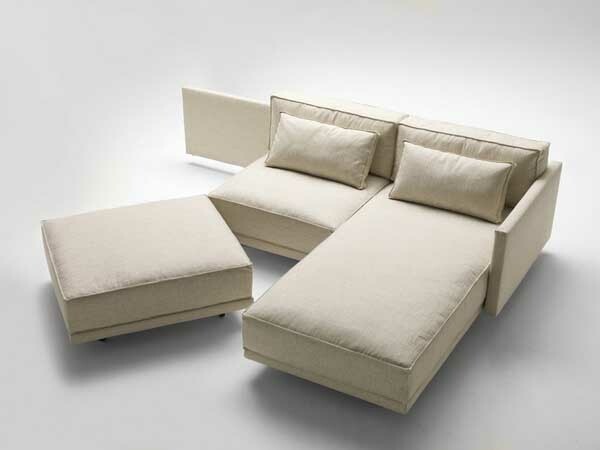 There are now sectional designs that have a movable futon. Like the sofa featured here, you can move an end cushion to create a full bed. The piece can easily be moved back to create a full couch that provides ample seating for entertaining. This can turn your living room into a bedroom within seconds. Your bed can also work overtime as a storage space. Under bed storage is a great way to incorporate storage spaces that are out of the way. Using shelves or drawers as your bed frame gives you a new storage space in an area that would’ve gone unused otherwise. While these designs are taking the market by storm, you don’t need to have special furniture to have a multifunctioning space. It can be as simple as having a table that acts as a dining table and a desk when needed. Lighting can create an ambiance throughout your home. In an open floor plan like a loft, the right light fixture can make all the difference. You want a lighting solution that can fill the space and still provide warm light. Take advantage of the high ceilings and large open area by installing light fixtures at different heights throughout your loft. This can highlight the incredible architecture of your home, as well as add visual interest. Pendant lights and chandeliers that hang from the ceiling produce a warm light that can add a dynamic look to your loft space. For a rustic look and dimmer lights, candles can be used as a design accent around the space. If you have exposed support beams lining your ceiling, draping string lights around them can add a blanket of warm light to your space. All of these light fixtures have a variety of designs that can fit into any design aesthetic. 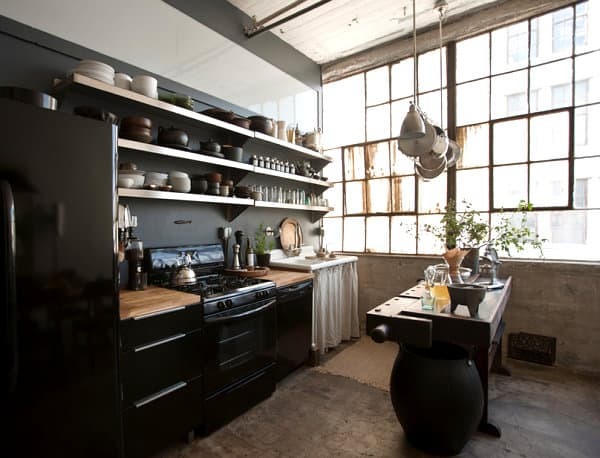 Because many lofts utilize an industrial design aesthetic, Edison bulbs are a popular option. These feature a completely transparent bulb that exposes the inner wiring. Because a loft space is completely open, it can be hard to find storage spaces that are aesthetically pleasing. You don’t have the option to store things out of sight in the basement. This just means that you have to incorporate storage into your design. Closed cabinets can interrupt an open floor plan and stop the flow of light that’s coming into your space. Open shelving is a trendy way to keep the space open and provide a storage space. This is especially popular for storing extra dishes and serving pieces in the kitchen. Interesting stacks of pottery that pull in bright colors and different shapes add a uniqueness to your space. You can find storage in your furniture as well. Coffee tables that have an open top for magazines and remotes are becoming standard designs. You can make the piece a shadow box design with an open window pane table top, or keep it hidden with a solid top. You can also use your ottoman as a storage piece. Most ottomans are designed to have a top that opens to an open space that can store any miscellaneous electronics or cords. If you’re looking for more of a separation between spaces in your loft, use open back bookshelves. These provide a place to store things, separates the rooms, and still allows the pass through of light. If you want to keep some items hidden, but still in open storage, you can use baskets. You can buy designs that come with a fitted lid to keep your storage space contained, but prettier than a standard plastic tub. Loft style homes have unique designs built into their structure. You can enhance these dynamic features with clever interior design decisions. This includes everything from furniture to major structural pieces, like a staircase. If a custom spiral stair is the right addition for your loft style home, call one of our consultative designers today! They can help you create a one of a kind spiral stair design that fits seamlessly into your home. Salter will help you create a one-of-a-kind spiral stair solution matched to your home’s style while maximizing your space and giving you something beautiful, safe, and durable all delivered directly to your front door. Why Purchase a Spiral Stair? © Copyright Salter Spiral Stair 2019. We value your privacy. Information collected will never be sold, shared, or rented to others.